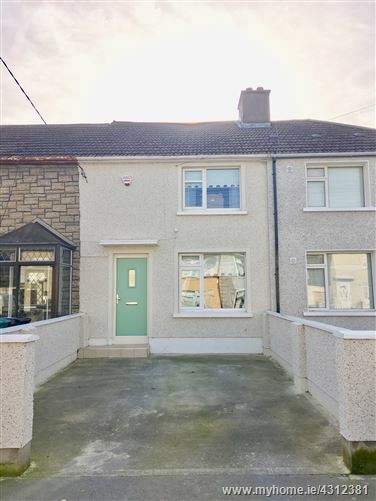 Property Partners Payne MIPAV TRV MCEI are delighted to present this perfect 3 bed property extended to the rear and into the attic space with Dormer conversion creating more headroom and floor space than most other attic conversion options. This fabulous 3-bedroom mid terraced property comes to the market in turnkey condition. In recent years the current owner made many upgrades that meets the needs of today’s discerning buyer. There is a modern feel to this property throughout with a spacious living room, extended kitchen come dining, 3 bedrooms and fully tiled family bathroom and Dormer Attic Conversion. To the rear the property enjoys a sunny south orientation and to the front is the benefit of off-street parking. Ballyfermot is bordered to the north by the N4, to the south by the N7 and to the west by the M50. There is also relative ease of access to the city centre. Currently, Dublin Bus (routes 40, 79, 79A, 76, 76A, 18, 26.) serve the area. There is an abundance of green space and playgrounds within walking distance of the property with Markievicz Park, Longmeadow’s Park and War Memorial Gardens conveniently located just a short stroll from your doorstep. Soccer, GAA, boxing, equestrian, rugby, badminton, martial arts, snooker, pool, bowling, squash, handball, racquetball, indoor go-karting, tennis, pitch and putt, fishing, boules, rock-climbing, River Liffey rowing, and table tennis are all represented by local clubs. Hallway: 2.74 x 1.84. recessed lighting, ceramic floor tiling, alarm panel.